DE 9 begins at an interchange with DE 1 just south of the toll road terminus at the south end of Dover Air Force Base near the city of Dover in Kent County. Past DE 1, the route heads north-northeast on two-lane undivided Bayside Drive. DE 9 soon reaches an intersection with Kitts Hummock Road, which leads east to the John Dickinson Plantation, which is part of First State National Historical Park, and the community of Kitts Hummock on the Delaware Bay. Following this, the route passes between the runways of Dover Air Force Base to the west and fields to the east. Along this stretch, Heritage Road leads west to the Air Mobility Command Museum on the base grounds. After the air base, the road continues north through a mix of farmland and woodland with some homes to the west of the Little Creek Wildlife Area. DE 9 crosses the marshy Little River and enters the town of Little Creek, where it becomes Main Street and is lined with residences. The route comes to an intersection with the eastern terminus of DE 8 as it leaves Little Creek and becomes Bayside Drive again. The road continues northwest through farmland with some trees and homes, passing to the southwest of Octagonal Schoolhouse before heading through the community of Cowgills Corner, where it crosses White Oak Road/Savannah Road. Past this intersection, the route runs southwest of Chandelle Estates Airport. DE 9 curves to the north at the Leipsic Road/Squawigm Road intersection and enters the town of Leipsic. At this point, the route turns northwest onto Denny Street and runs past homes and businesses, curving north to intersect the eastern terminus of DE 42. DE 9 heads into marshland and crosses the Leipsic River on a high-level bridge, leaving Leipsic. Here, the road becomes Smyrna-Leipsic Road and enters agricultural areas with some woods and homes. Smyrna-Leipsic Road curves to the northwest and the route continues north on Hay Point Landing Road, running to the west of the Bombay Hook National Wildlife Refuge, where the Allee House is located. DE 9 comes to an intersection with DE 6 as it passes through the Woodland Beach Wildlife Area, turning to the northwest as it heads through a mix of woods and marshland. The road continues to a high-level bridge over the Smyrna River. Upon crossing the Smyrna River, DE 9 enters New Castle County and becomes Flemings Landing Road, heading through the community of Flemings Landing and passing through agricultural areas with some woods to the west of the Cedar Swamp Wildlife Area. The road runs to the north before curving northwest again. The route turns west onto Taylors Bridge Road and crosses the marshy Blackbird Creek. DE 9 curves to the north-northwest and passes through more rural areas with some residential subdivisions to the west. The route heads to the northwest before turning northeast onto Thomas Landing Road in Mathews Corners, with DE 299 continuing northwest on Taylors Bridge Road towards Odessa, where the Odessa Historic District is located. DE 9 runs between farmland to the north and housing developments to the south prior to turning north onto Thomas Corner Road. The road curves northeast as Silver Run Road through agricultural areas before entering marshland and crossing the Appoquinimink River. After this, the route turns north to remain on Silver Run Road and passes through areas of farms, woods, and wetlands in the Augustine Wildlife Area a short distance to the west of the Delaware River. DE 9 turns east onto Bayview Road before turning north onto St. Augustine Road and following the west bank of the Delaware River. The road reaches the community of Port Penn, where it is lined with homes. In Port Penn, the route turns west onto Market Street before turning north onto Delaware City Port Penn Road near the Port Penn Interpretive Center. Upon leaving Port Penn, DE 9 heads through marshland with some fields and woods within the Augustine Wildlife Area. The route rises onto the Reedy Point Bridge, which carries it over the Chesapeake & Delaware Canal. After crossing over the canal, the road crosses over Fort DuPont State Park, curving northwest and passing to the southwest of Fort DuPont and the Governor Bacon Health Center. DE 9 continues into the city of Delaware City and becomes 5th Street, crossing the Delaware City Channel on a bridge before intersecting the eastern terminus of the Michael N. Castle Trail. Past the bridge, the road heads through residential areas of the city and intersects Clinton Street, which leads northeast to the Forts Ferry Crossing which provides access to Fort Delaware on Pea Patch Island, part of Fort Delaware State Park. Upon leaving Delaware City, DE 9 continues west as Wrangle Hill Road, passing between PBF Energy's Delaware City Refinery to the north and farm fields to the south. The route turns north onto River Road to head into the oil refinery complex, with DE 72 continuing west on Wrangle Hill Road. Within the oil refinery, the road crosses Norfolk Southern's Reybold Running Track railroad line. DE 9 leaves the industrial area upon crossing marshy Red Lion Creek and continues into a mix of fields, woods, and marshland, with DE 9 Truck heading northwest on Hamburg Road. At this point, the route turns to the northeast and passes between Ommelanden Park to the west and the Ommelanden Hunter Training Center to the east before running between residential subdivisions to the west and the northern training grounds for the Delaware National Guard to the east. DE 9 passes through wooded areas with some homes before continuing into industrial areas and crossing a railroad spur. The road continues into marshland immediately to the northwest of the Delaware River before entering the city of New Castle. At this point, DE 9 becomes West 7th Street and passes and industrial development. The route turns north-northwest onto Washington Street and crosses Norfolk Southern's New Castle Secondary railroad line, heading into residential areas. DE 9 comes to an intersection with the southern terminus of DE 141 and the eastern terminus of DE 273, at which point DE 9 Truck returns to the route by way of DE 273. Here, DE 9 turns east onto Delaware Street. The road carries one eastbound lane and two westbound lanes, with a multi-use trail parallel to the north. The route narrows back to two lanes and crosses the Jack A. Markell Trail, where the parallel multi-use trail ends, before it heads across the Norfolk Southern line again, at which point it turns east-northeast onto Ferry Cut Off Street near the New Castle Historic District. The historic district is home to the New Castle Court House Museum, New Castle Green, and the Sherriff's House, which are all part of First State National Historical Park. The road passes homes and businesses before intersecting East 6th Street. Here, DE 9 turns northeast onto East 6th Street, crossing a marshy creek and widening into a four-lane divided highway. The route curves north and becomes Wilmington Road, passing through commercial areas. The road crosses the Norfolk Southern New Castle Secondary again and runs through suburban residential neighborhoods and businesses, leaving New Castle. DE 9 becomes New Castle Avenue and passes to the west of Veterans Memorial Park before it comes to an interchange with I-295/US 40 a short distance to the west of the Delaware Memorial Bridge over the Delaware River. After the Rogers Road intersection, DE 9 becomes a four-lane undivided road that continues through industrial and residential areas, crossing under I-495. The road briefly becoming a divided highway again and intersects the southern terminus of DE 9A, which heads east to provide access to I-495 and the Port of Wilmington. After DE 9A, DE 9 enters the city of Wilmington and heads through urban areas as an undivided road, crossing Norfolk Southern's Shellpot Secondary before intersecting the northbound direction of US 13. At this point, DE 9 splits into a one-way pair with the northbound direction becoming concurrent with northbound US 13 on one-way New Castle Avenue and the southbound direction following southbound US 13 on South Heald Street, briefly turning east along with northbound US 13 on D Street at the south end of the one-way pair. The one-way pair, which carries two lanes in each direction, passes rowhomes and businesses, with New Castle Avenue merging onto South Heald Street. Here, US 13/DE 9 continue north-northeast on four-lane undivided South Heald Street, coming to an intersection with the northern terminus of DE 9A. Following this, the road becomes East 4th Street and heads north-northwest across the Christina River on a drawbridge. US 13/DE 9 curves northwest and passes under Amtrak's Northeast Corridor railroad line, at which point northbound US 13 splits from the road by turning northeast on North Church Street at the crossing of a railroad spur. A block later, the concurrency between DE 9 and southbound US 13 ends at the point where southbound US 13 joins the road from North Spruce Street. DE 9 continues northwest through residential and commercial areas as a four-lane undivided road, entering downtown Wilmington. Here, it intersects US 13 Bus., which is routed on the one-way pair of North Walnut Street northbound and North King Street southbound. In between these two streets, the road runs to the south of the New Castle County Court House. Upon crossing North Market Street, the route becomes West 4th Street and passes to the north of the Orlando J. George, Jr. Campus of Delaware Technical Community College. DE 9 continues into residential areas and crosses under I-95/US 202, with access to that road provided by northbound North Adams Street and southbound North Jackson Street. Past this, the road heads through more of the city before reaching the Little Italy neighborhood. Here, DE 9 intersects the eastbound direction of DE 2 (North Lincoln Street) before coming to its northern terminus at the westbound direction of DE 2 (North Union Street). Much of DE 9 is designated as part of the Delaware Byways system. From the southern terminus north to New Castle, DE 9 is designated as part of the Delaware's Bayshore Byway (formerly Route 9 Coastal Heritage Byway), a road that is noted for following the Delaware River and Delaware Bay shoreline. The byway continues south past the terminus of DE 9 toward Lewes. The sections of the route between DE 299 east of Odessa and 7th Street southwest of New Castle, Wilmington Road north of New Castle and A Street in Wilmington, and along 4th Street in Wilmington between Swedes Landing Road and US 13 Bus. and Market and West streets are part of the Harriet Tubman Underground Railroad Byway. The section of DE 9 between US 13 Bus. and Van Buren Street in Wilmington is part of the Washington–Rochambeau Revolutionary Route, a National Historic Trail. DE 9 has an annual average daily traffic count ranging from a high of 20,160 vehicles at the intersection with the northern terminus of DE 9A to a low of 412 vehicles at the border between Kent and New Castle counties. The portion of DE 9 concurrent with DE 273 is part of the National Highway System. 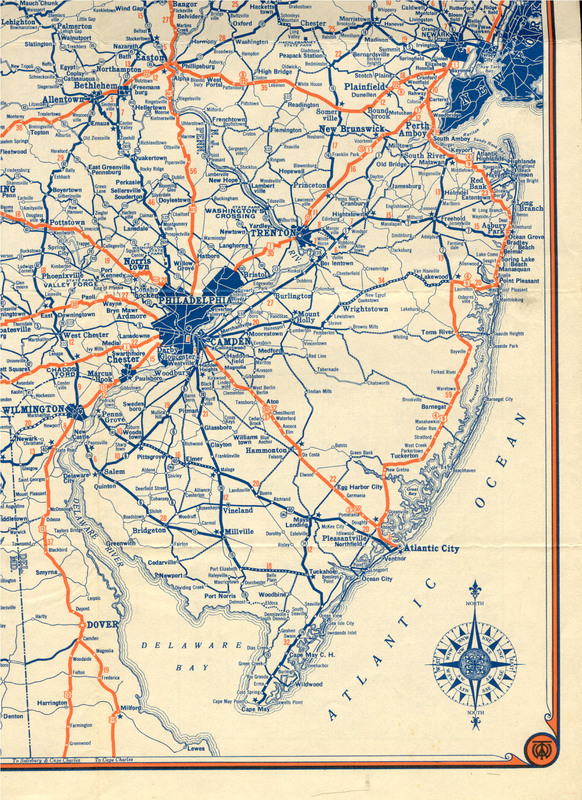 The section of the present route between New Castle and Wilmington was constructed as the New Castle and Wilmington Turnpike, a private turnpike, in 1813. What would become DE 9 originally existed as a county road by 1920. Four years later, the road between Leipsic and Smyrna was upgraded to a state highway. In addition, the current alignment of DE 9 around Taylors Bridge and between Delaware City and Wilmington was paved. In 1931, what would become DE 9 was upgraded to a state highway between Bay Road and Little Creek and between Port Penn and Delaware City. A year later, the road became a state highway between Delaware City and Wilmington. By this time, what would become DE 9 between Little Creek and Leipsic was upgraded to a state highway. A drawbridge was constructed over the Delaware City Channel in 1933. This drawbridge was sealed and rendered inoperable in 1971. DE 9 was designated to run from US 113 (now DE 1) west of Kitts Hummock north to US 13 in Smyrna by 1936, following its current alignment to Leipsic and Smyrna-Leipsic Road to Smyrna. By 1942, what is now DE 9 between the Taylors Bridge area and Port Penn was paved. In 1956, New Castle Avenue was widened to a four-lane divided highway between Landers Lane and Rogers Corner. DE 9 was extended north to US 13 Alt. (now US 13) in Wilmington by 1959, being rerouted off Smyrna-Leipsic Road to follow its current alignment to New Castle, passing through that city on 6th Street before continuing along its current alignment to Wilmington. At this point, the entire route was paved. The current Reedy Point Bridge carrying DE 9 over the Chesapeake and Delaware Canal was completed in 1968. By 1971, DE 9 was extended north to its current terminus at DE 2. DE 9 was realigned to bypass New Castle by 1984 by following Washington Street and DE 273. On October 27, 2008, construction began to convert the intersection at the southern terminus with DE 1 into an interchange, with Governor Ruth Ann Minner in attendance at the groundbreaking ceremony. Construction of the interchange at DE 1 was completed in 2009. On September 6, 2016, the U.S. Army Corps of Engineers began construction to demolish and replace the drawbridge carrying DE 9 over the Delaware City Channel with a fixed-span bridge. Construction of the bridge was expected to be complete in February 2017, but was delayed by winter weather. The new bridge opened to traffic on April 28, 2017. The Delaware State Highway Department recommended that DE 9 along the Delaware Bay and Delaware River be designated a scenic highway as far back as 1965. In 2007, the Route 9 Coastal Heritage Byway was nominated and designated as a Delaware Scenic and Historic Highway. Delaware Route 9A (DE 9A) is a two- to four-lane road in Wilmington, Delaware that serves as the primary access route to the Port of Wilmington as well as provide access to I-495. The official designation of the route runs 0.78 miles (1.26 km) along Terminal Avenue between DE 9 and the Port of Wilmington, interchanging with I-495. Signage has the route continuing north along Christiana Avenue to an intersection with US 13 and DE 9 for a total length of 2.0 mi (3.2 km). Christiana Avenue originally became a state highway by 1924 becoming a part of US 40 that connected to a ferry across the Delaware River to Penns Grove, New Jersey in 1926. US 40 was removed from this road by 1931 and it later became part of DE 48 by 1936. DE 48 was subsequently removed by 1952 following the discontinuance of the ferry in 1949. DE 9A was designated by 1971. Delaware Route 9 Truck (DE 9 Truck) is a truck bypass of a stretch of DE 9 south of New Castle. It heads northwest from DE 9 on two-lane undivided Hamburg Road, passing through farmland with some development. In Tybouts Corner, the truck route turns northeast to join US 13 on the four-lane divided South Dupont Highway. The road passes through farmland with some residential and commercial development. Farther north, the road heads into business areas, passing under Norfolk Southern's New Castle Secondary railroad line before intersecting US 40 in State Road. At this point, US 40 joins US 13 and DE 9 Truck, with the road widening to eight lanes. In Hares Corner, DE 9 Truck turns east to follow DE 273 on two-lane undivided Frenchtown Road, heading east between business parks to the south and farm fields to the north. DE 9 Truck ends along with DE 273 at an intersection with DE 9 and the southern terminus of DE 141 west of New Castle.